The following is a slightly edited excerpt from the working paper version of my paper “How much do hospitals cost shift? A review of the evidence,” to appear in issue 1, volume 89 of The Milbank Quarterly (expected March 2011). See also “Estimating Hospital Cost Shift Rates:A Practitioners’ Guide“. This post has been cited in the 3 February 2011 edition of Health Wonk Review. It is well-known that hospitals charge different payers (health plans and government programs) different amounts for the same service even at the same point in time, a phenomenon known to economists as “price discrimination” (Reinhardt 2006). It is also widely believed that hospitals charge more to one payer because it received less (relative to costs or trend) from another, a dynamic, causal process I’ll call “cost shifting,” following Morrisey (1993, 1994, 1996) and Ginsburg (2003), among others. Price discrimination and cost shifting are related but different notions. The first depends on differences in market power, the ability to profitably charge one payer more than another but with no causal connection between the two prices charged. In the second, there is a direct connection between prices charged. In cost shifting, if one payer pays less relative to costs (Medicare, say), another necessarily pays more (a private insurer, say). Cost shifting implies price discrimination but the existence of price discrimination does not imply cost shifting has occurred or, if it has, at what rate (i.e. how much did one payer’s price change relative to that paid by another). A 1992 report by the Medicare Prospective Payment Assessment Commission (ProPAC) asserted that hospitals could recoup underpayments by Medicare from private payers (ProPAC 1992). Were that so, hospitals would need not need to fear inadequate government payments. Yet, somewhat paradoxically, around the same time hospitals used the cost shifting argument to call for higher public payment rates (AHA 1989). More recently, during the debate preceding passage of the new health reform law—the Affordable Care Act (ACA)—two insurance and hospital industry-funded studies (PWC 2009, Fox and Pickering 2008) and one peer-reviewed publication (Dobson et al. 2009) reasserted a high degree of cost shifting to private payers stemming from public payment shortfalls. Half to all of shortfalls were assumed to be shifted to private payers. The cost shifting issue is certain to arise again in the near future. Though cost shifting was debated during consideration of the ACA, public payment policy is not settled, nor will it ever be. The new health reform law includes many provisions that are designed to reduce the rate of growth of public sector health care spending. For instance, the law’s provisions will reduce annual updates in payments for Medicare hospital services, pay for them in part based on performance on quality measures, lower payments for preventable hospital readmissions and hospital-acquired infections, among others (Kaiser Family Foundation 2010, Davis et al 2010). In aggregate and over the ten-year period 2010-2019, the CBO scored the savings from reduced Medicare hospital payments at $113 billion (CBO 2010b). Additionally, Medicaid eligibility will expand in 2014 to all individuals with incomes below 133% of the federal poverty level. The Congressional Budget Office has estimated that by 2019 Medicaid enrollment will grow by 16 million individuals (CBO 2010a). To the extent that some of these new Medicaid beneficiaries would have otherwise been covered by private plans (a crowd-out effect; Pizer, Frakt, and Iezzoni 2010), lower Medicaid payments relative to private rates may increase incentives to shift costs. On the other hand, to the extent that Medicaid expansion, as well as the equally large (CBO 2010a) expansion of private coverage encouraged by the ACA’s individual mandate and insurance market reforms, decrease rates of uninsurance and uncompensated care, the law may decrease hospitals’ need to shift costs. Nevertheless, if past experience is any guide, as some of ACA’s provisions are implemented, they are likely to be challenged with cost shifting arguments by the hospital and insurance industries. 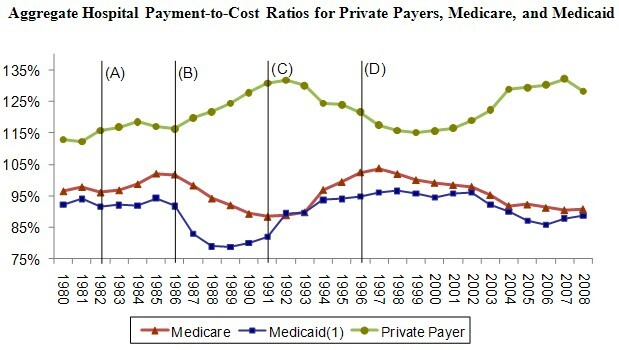 In tomorrow’s post, I will review discuss the descriptive evidence that is often pointed to as the signature of cost shifting: time series of aggregate hospital payment-to-cost ratios by payer (below). Does this figure illustrate cost shifting? It’s not a simple question. Figure sources: AHA (2003, 2010). AHA (American Hospital Association). 1989. CEO Answers Letter Charging Medicare Rip-Off by Hospitals. AHA News. 20 February. AHA (American Hospital Association). 2003. Trendwatch Chartbook 2003: Trends Affecting Hospitals and Health Systems. AHA (American Hospital Association). 2010. Trendwatch Chartbook 2010: Trends Affecting Hospitals and Health Systems. CBO (Congressional Budget Office). 2010a. H.R. 4872, Reconciliation Act of 2010 (Final Health Care Legislation). CBO (Congressional Budget Office). 2010b. Distribution Among Types of Providers of Savings from the Changes to Updates in Section 1105 of Reconciliation Legislation and Sections 3401 and 3131 of H.R. 3590 as Passed by the Senate. http://web.archive.org/web/20120118172940/http://www.cbo.gov/ftpdocs/113xx/doc11379/Distribution.pdf , accessed 16 November 2010. Davis P, Hahn J, Morgan P, Stone J, Tilson S. (2010). Medicare Provisions in the Patient Protection and Affordable Care Act (PPACA): Summary and Timeline. Congressional Research Service.November 3. Dobson A, DaVanzo J, El-Gamil A, and Berger G. 2009. How A New ‘Public Plan’ Could Affect Hospitals’ Finances and Private Insurance Premiums. Health Affairs. 15 September. Fox W, Pickering J. 2008. Hospital & Physician Cost Shift: Payment Level Comparison of Medicare, Medicaid, and Commercial Payers. Milliman. December. Ginsburg P. 2003. Can Hospitals and Physicians Shift the Effects of Cuts in Medicare Reimbursement to Private Payers? Health Affairs. October. Kaiser Family Foundation. (2010). Health Reform Implementation Timeline. http://healthreform.kff.org/timeline.aspx, accessed 16 November 2010. Morrisey M. 1993. Hospital Pricing: Cost Shifting and Competition. EBRI Issue Brief. May (137). Morrisey M. 1994. Cost shifting in health care. Separating evidence from rhetoric. Washington, DC: AEI Press. Morrisey M. 1996. Hospital Cost Shifting, a Continuing Debate. EBRI Issue Brief. December (180). Pizer S, Frakt A, Iezzoni L. 2010. The Effects of Health Reform on Public and Private Insurance in the Long Run. Health Care Financing & Economics Working Paper. VA Boston Healthcare System. ProPAC (Prospective Payment Assessment Commission). 1992. Optional Hospital Payment Rates. Congressional Report C-92-03. Washington, DC. U.S. Government Printing Office. PWC (PriceWaterhouseCoopers). 2009. Potential Impact of Health Reform on the Cost of Private Health Insurance Coverage. October. Reinhardt U. 2006. The Pricing of U.S. Hospital Services: Chaos behind a Veil of Secrecy. Health Affairs 25(1): 57-69. Starr P. 1982. The Social Transformation of American Medicine. New York: Basic Books. From the accounting side of hospital finance, this use of the word “charge” drives us crazy. I understand why an economist might with perfect clarity assume that what you get is equivalent to what you charged, on the accounting side it doesn’t work that way. As the Dir of Reimb I spend a huge portion of my time making sure I know the variance (i.e. the contractual) between my hospital’s charges and what the hospital will receive in payment. In doing the Medicare Cost Report, in fact, if we somehow didn’t charge equally across the board to all payors we have to mathmatically adjust our data so that charge equivalency is achieved. We balance between attempting to explain this to the staff (i.e. in most cases the charges don’t really ties directly to the payment received) and fearing if we explain this to the staff they’ll stop caring that the charging is done properly and it does have accounting and future ratesetting effects. But, nonetheless, to the minions in finance like me, a charge is not equivalent to your receipts. We don’t charge differently. We contractually accept different payments. Of course, if we didn’t add layers and layers of complexity (i.e. hospital charges are so high — and continue to grow — because it gives us add’l payment on the few remaing %-of-charge contracts and the few self-pay patients that actually pay, or, yes, the need to squeeze out some kind of bottom line from the payors that will actually pay you more than your costs) it wouldn’t be American healthcare. Thanks, just had to get the charge thing off my chest. @mbe – Thanks. As for charge vs. payment, there is a lot of sloppy language and I’m guilty of it too. Which is meant in certain writing is often only clear from context. I actually go into this issue in my review when I discuss some papers that make a clear distinction. It is good to be sensitized to this, however. If you had gotten to me sooner, I might have written the bit you quoted differently. Thanks, Austin. I don’t think it’s confusing to people in general but then they try to talk to someone like me and I’m going “but … but … but …” Each discipline has its own tightly technical terms that the rest of us violate all the time. But then the most popular question I have to answer is “why does an aspirin cost so much in a hospital?” I don’t know if I’ve ever managed to get anyone to understand my explanation. Price/charge/payment transparency would help sort out some of this confusion. Currently, most hospitals consider their contractual reimbursement rates confidential information and will not disclose it. This leaves most consumers blind to the “cost’ of their medical care and unable to make the purchasing decisions that most of the “free market” people are touting as the solution to our problems. mbe, I dread the prospect of cost-based charges. There is no incentive to be efficient and improve value. Or do you mean to normalize charges at a given point in time, and then control future increases by indexing them to inflation, or GDP, or something? Austin, I’m looking forward to this series, and glad to see you will be using the distinction between cost-shifting and discriminatory pricing. 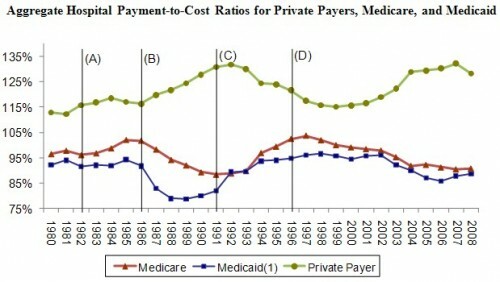 If Medicare and Medicaid were to increase payment to 102% of costs, would private insurance contractual rates go down? (doubt it in the current environment, but interested to see what you say.) I do hope that you go into some detail on the private insurer side of the equation about what makes this payment situation possible. @Jonathan – I’ve got two more posts planned, but mostly on background. If you want my full take, read my paper. Even if you skip the guts of it, the introduction, background, and conclusion are all quite readable. If you can handle the technical review of the literature, then you can extract the full value. I’m sure I’ll chime up about it again too. One “price” not covered in your graph is the “charge master” rate that is typically billed to everyone and is the basis for all of the discounts. In my experience, this is anywhere from three to ten times the Medicare rate and is far above the “Private Payer” line in your graph. This is what those people without insurance are billed and expected to pay. Your private payer line included all of the insurance negotiated discounts. If you are a true private payer (i.e. paying for your own care out of pocket), it often seems as if the hospitals are trying to cost shift all of the cost of care to you. These charges are not reasonable for anyone to pay but are the rate on which all of the discounts are calculated. Austin, sections 2.4 and 2.5 were what I was looking for. Excellent, nailed all the points I had in mind. From a policy perspective, the observation about public acceptance of limited networks is critical. So much is likely to hinge on whether a large health plan will be able to credibly tell a large health system to take a hike if it demands prices that are too high. It’s pretty much the only thing that has worked to keep costs in line with GDP from the private side, other than integrated plans with their own delivery systems. Can the public be persuaded to not go nuclear if plans play hardball again with providers? @Jonathan – My answer to your final question is, “No.” Plans are vilified and providers retain most of the admiration they’ve enjoyed for decades. It is certainly true now. If it remains true, it’s going to be government controls all the way. And I say that as someone who works in the health insurance industry. You would think conservatives, who espouse market solutions, would want to direct their rhetorical energies to removing this barrier to effective insurance bargaining. I dont think they get that this is the best of their options (not to say it has to work alone). Plan-based utilization controls and care management make an impact, but how much more can be done? They won’t stop the cost trend from outpacing GDP, let alone reduce the share of GDP. Dramatic increases in cost sharing will have a huge political cost for Republicans and a huge social cost in bankrupty and avoided necessary care. I don’t think this issue of health plan bargaining power gets nearly the attention it deserves. If you are concerned about insurance companies bargaining power, then the best solution is what they do in Switzerland. The government sets prices for medical services and everyone must use the same price. This is open and transparent and eliminates the need for plans to negotiate individually with service providers. Insurance plans have a level playing field and can compete on providing service and price to consumers. The US system of opaque pricing leads to large inefficiencies in service and cost as well as a Kafkaesque dilemma for consumers. Increasing demand and thus gaining greater economy of scale and greater efficiency by higher utilization of resources. The classic example is low fares for air travel. The standby or vacation traveler is given a low fare which always higher than the marginal cost of carrying them. The plane is flying no matter what, so the added cost of filling added seats or cargo bays is marginally higher fuel cost plus added labor cost of servicing them. The lower price is required to create the demand for travel; the full equal share fare is too high at all price points to fill the plane. By setting the price at the near inelastic price-demand point, the flight is paid for, but sometimes the plane will be partially or nearly empty – regular service for passenger/cargo are required by the near inelastic demand. If hospitals and doctors are engaging in price discrimination, they must be seeking to increase demand to make up for the insufficient demand from the inelastic demand. If cost shifting not taking place, then the wealthy who pay full price for hospital care out of pocket are leaving too much excess capacity, so hospitals cut prices for the less rich who have insurance, and then cut prices even more to create demand from the poor who must have government pay for their care. @mulp – Michael Morrisey’s book (not his papers) goes into the theory as you sketched it. I think it is out of print. I’ll see if I can host the PDF. As a longtime admirer of Canadian Prof. Robert Evans, let me offer a somewhat sideways perspective. Americans are locked into the unquestioned assumption that hospitals must sustain themselves on user fees. Using a crude example, if a hospital costs $1 million a month to operate and it has 100 patients that month, then some mechanism must be found to collect an average of $10,000 per patient, or eventually the hospital will go broke. The passive insurers who pay $20,000 therefore ‘make up’ for the self-pay patients who are streched to pay even $1,000. And so on. Would it not be a much more livable system if most of the $1 million was collected from civic taxes, and the user fees were a minor part of revenue? This is how I believe the French and German health systems operate. When a German patient pays $100 for gall bladder surgery, no one believes the surgery really cost $100 to perform. The German and his employer have been paying total payroll taxes of 14% so that large user fees are not required. Public provision is not alien to America. If I pay the fire department $200 after they come to my house with ten men and four engines, obviously the total cost is in the thousands, But taxes make up the great majority of fire department revenue, and this has been true across America for over a century. And it would be a monstrous waste of effort, compared to the stable system that now requires (horror of horrors) the payment of taxes. As cities and states are on a race to the bottom for lowering taxes, one cannot expect them to step forward and correct this problem. But the federal government could, if only someone could step back from the pricing wars and see a better way. The real challenge, once one gets past the nightmare of user fees, is to be sure that insurance premiums go down as taxes go up. Even assuming that all medical pricing is done in good faith, it seems to me that trying to find a solution to the cost/quality equation in the payor/payee negotiation or formula is an exercise in futility that leads to such practices My understanding is that no country has ever been able to keep health care cost under control, no matter the systematic payor/payee solution adopted locally. This has resulted from the industrial world becoming continuously more affluent and following us down the road of self indulgence. The lowest cost/best quality health care systems appear to be in the countries where people follow healthy life styles; nutritious diets eaten in modest quantities, regular exercise (read, lots of walking), modest use alcohol, tobacco, etc., modest use of treatments and medicines that are not cost effective; health care system and in some cases socio-economic units built on caring leadership that results in the populous buying into staying healthy and cooperating in the cure when not healthy.